Published: April 27, 2016 at 02:50 p.m. Updated: April 27, 2016 at 04:18 p.m.
CHICAGO -- Jalen Ramsey doesn't know what team will call his name during Thursday night's NFL Draft. He does know exactly what position he wants to play at the next level. "Corner," Ramsey replied with no hesitation when Around The NFL asked what position he hopes to anchor in the NFL. It's the correct response, even if only from a monetary perspective. The franchise tag for corners in 2016 was nearly $14 million. It was $10.8 million for safeties. Standing next to the wide-shouldered, 6-foot-1 cover man, Ramsey doesn't look like a corner. He looks closer to a linebacker. Some believe the rookie will transition to safety while sliding to corner in certain coverages. Having the size to tackle along with quick hips needed to cover, Ramsey could be the perfect hybrid player becoming more common in today's NFL. Speaking Wednesday morning at an NFL Play 60 Clinic in Chicago, Ramsey insisted he wants to play on the outside, but will line up wherever asked. "I will play anywhere a team wants me to play, just like I did in college it doesn't matter to me. I want to play ball," he admitted. Ramsey has been rumored as high as the No. 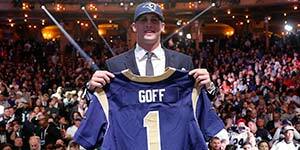 1 pick, when his hometown team Tennessee Titans owned the selection. The corner said he believes the Titans would have selected him at No. 1 if they held onto that selection. Now he is fine being taken at any pick. "It doesn't matter how high I go. It doesn't matter if I go at three or 33 or wherever," Ramsey said. "This has all been my dream. ... I'll be happy regardless." NFL Media draft analyst Daniel Jeremiah said Tuesday that he's hearing Ramsey being connected to the Cowboys at No. 4. That is a scenario the corner called "a dream situation, literally a dream come true" after rooting for the 'Boys growing up. Whether it's in practice or a game, Ramsey called Dez Bryant the receiver he most wants to cover. "I just like his mindset, his competitiveness, people call it cocky, call it confident, you can call it arrogant, you can call it whatever you want," Ramsey said of Bryant. "He's one of the best receivers in the game and that's always been the guy who I wanted to go up against, whether it's in practice or the game." It's that type of mentality Ramsey believe he owns. "You can call me cocky, you can call me arrogant, but I know what I am," he said. "I'm humble, I'm just confident in my abilities. I have no reason to not be confident. I play defensive back. You have to be confident playing defensive back. Period."